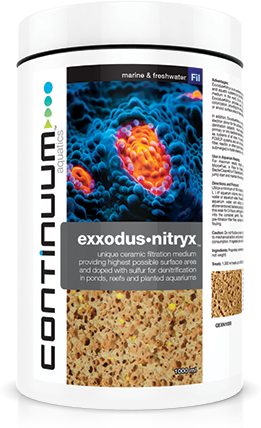 CONTINUUM EXXODUS•NITRYX (Nitrate removal for 3-5 years) Nothing Lasts Longer. In addition Exxodus•Nitryx is unique in that it is doped with sulfur particles which act as an electron donor for the cultivation of large amounts of anaerobic microbes to provide for a huge denitration capacity - much larger than any other known material. It may be used as your primary or only bacterial denitration medium. It works extremely well in nano aquariums as well as systems of all sizes. It is particularly well suited to reef systems with live rock including FOWLR systems and will not foster problems that alcohol denitrators may. Use in a canister filter reactor or other type of aquarium filter with SLOW water flow. Primarily designed to be submerged to foster anaerobic or anoxic conditions. No need for reactors no need for massive water flow. Can be used anywhere. Seeding is simple with the continuum ranges as explained below but there is no need to seed if you already have live rock and patience. But if you wish to obtain maximum efficiency much quicker then use the Bacter Gen MD (marine and reef) which can be found at ITEM NUMBER 282293636909 or Bacter Gen F item number 281762547005 for freshwater aquariums. This is a breakthrough revolutionary microbial culture specifically for denitration in all marine and reef systems. Just place the media in a bucket containing some aquarium water or RO water and add the amount of BacterGen MD for your tank size and leave to soak for 24 hours stirring every few hours and agitating the water by pouring out and back in every so often as well. Then gently place the media into your filter system. However for immediate operation in a new aquarium the use of Prodibio's Start Up item number 282044064032 is the perfect option as it is live cultures and therefore work immediately and can be added directly to your aquarium. If the aquarium is already established then Prodibio's Biodigest item number 280240172958 is the perfect product to get the media instantly running again as it is live cultures of bacteria. For maximum results should be used simultaneously with Reef BioPellet•Fuel Reef Micro•Fuel or Flora Viv Prolifera carbon sources as a growth accelerator and/or with BacterClean•M or F BacterGen•M or F or BacterGen•MD microbial cultures as appropriate to jump start and maintain the colonization process at elevated levels. Utilize a minimum of 160 ml (about 26 cubes) of Exxodus•Nitrx for every 100 U.S. gallons ( 400 L ) of aquarium volume more if bioload dictates. Rinse Exxodus•Nitrx gently in purified tap water or aquarium water. Pre-seed the product by placing it in a plastic bucket submerged in aquarium water and adding the recommended dose for your aquarium size of the aforementioned bacterial products (BacterClean or BacterGen). Allow the product to remain in this soak for 24 hours stirring gently occasionally or agitating the liquid by pouring out and back into the container gently. Place the seeded Exxodus•Nitrx into your filter. The use of a pre-filtration filter floss sponge or other mechanical pre-filtration is recommended to prevent fouling. This range of media is the most prolific filter media to appear on the Aquatics market anywhere in the world. This media has Nitrate (NO3) removal properties for 3-5 years. YES 3-5 years!!!!!. That means it out performs all the standard medias and resins out there. Plus when it no longer pulls out NO3 it still operates in the same way as the brands BIO MEDIA and lasts for around another 45 years as biological media. It's mind blowing!!!!. Shortly we will give some technical information via a link. explaining how it can out perform all other media's so massively. But for now if you need to know more information please email us at [email protected] and we will provide technical information and help. Just 250 ml of this plus 250 ml of the Phosphyx plus 250 ml of the BAC all by Continuum placed in an external filter will turn filtration figures on their head. As your filter will operate to clean over 1 800 litres of water now instead of standard external filter figures of around 100 to 600 litres. You will also cover every base of filtration including phosphate and nitrate removal. It can work placed anywhere in a steady flow of water no need to fluidise. The brick can be used by laying anywhere in a steady flow of water from inside external filters or in a sump and 1 brick will offer up over 100 000 square feet of surface area and treat 1000 gallons (4500 litres). You're reviewing: CONTINUUM EXXODUS•NITRYX (Nitrate removal for 3-5 years) Nothing Lasts Longer.